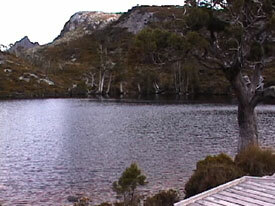 On our way west from Launceston to Strahan, on Tasmania's wild west coast, we stopped to walk though a tiny bit of the Tasmanian Wilderness World Heritage Area called the Cradle Mountain - Lake St. Clair National Park. 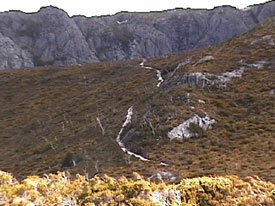 This is a rugged, isolated area of Tasmania where you can walk for days through desolate but breathtaking areas without seeing a soul. 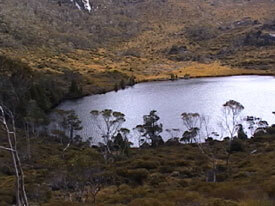 The Parks and Wildlife Service has a good website on Cradle Mountain, including a cool 3D map [Quicktime required] you can turn around and get an idea of how the place looks. Alternatively, have a look at a normal map. 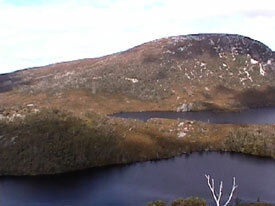 While Kath, Larry, and Elaine circled Dove Lake on one side, I trekked off on his own, trying to find the middle of the Overland Track, a thin trail that leads across the park. I also wanted to find Crater Lake, which is supposedly one of the deepest, most isolated of the many lakes that exist in the crevasses in this region. 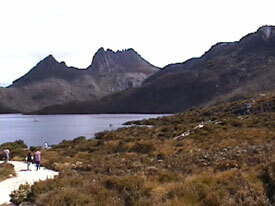 Witness the unbelievable beauty of the Cradle Mountain area, featuring Lakes Dove and Lilla, as well as too many peaks to count. 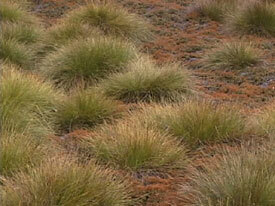 Take a bushwalk with truk as he searches for the elusive shores of Crater Lake. 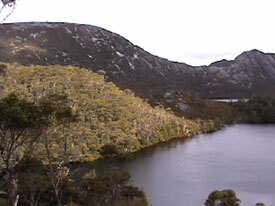 A shot of Cradle Mountain and Dove Lake. 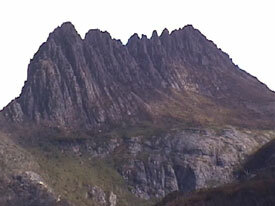 The jagged edges of Cradle Mountain. 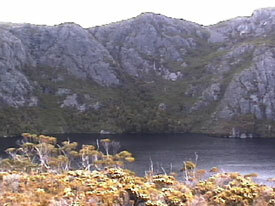 Dove Lake from the side. 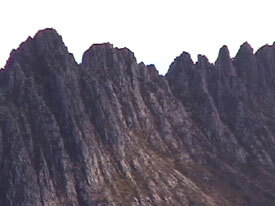 Close up of the Cradle Mountain peaks. 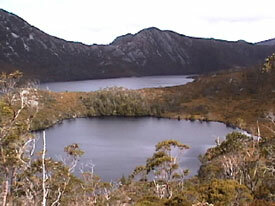 A tiny (and probably temporary) island in the middle of Dove Lake. 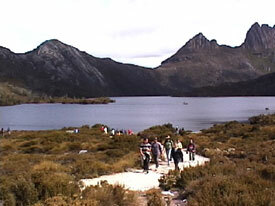 Some tourists return from Dove Lake as I prepare to set off. 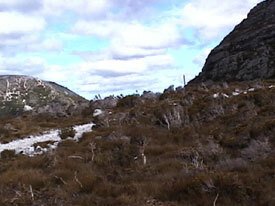 My first glimpse of Lake Lilla as I crest the hill. 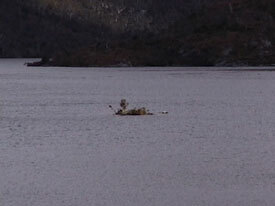 The shoreline of Lake Lilla. 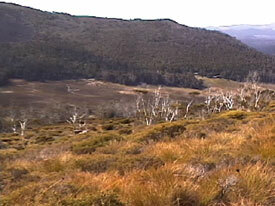 Trees ring the edges of some hills along the way. 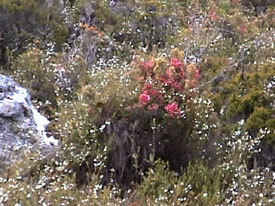 ... and a few flowers. 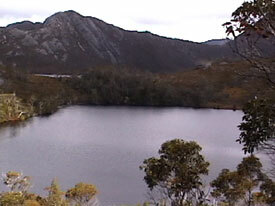 A shot of Lake Lilla from the side and a sliver of Dove Lake in the distance. Another shot, this time with sun. Even higher up above Lakes Lilla and Dove. 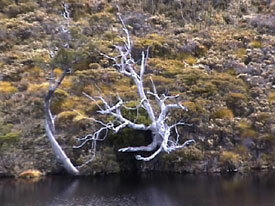 A gnarly tree on the side of an unnamed lake. 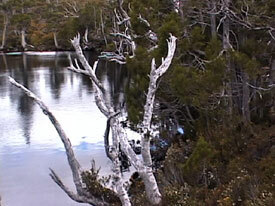 Right beside the unnamed lake, you can see the wooden walking area build to protect the trail. A close up of the trees along the bank. This photo gives a good sense of how the lakes dot this area and drain into one another. 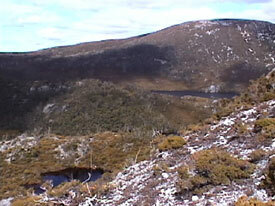 Above Lake Lilla looking down toward Lake Dove. 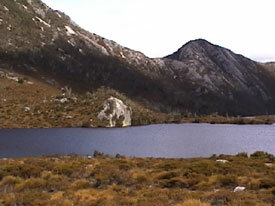 The valley below the lakes. 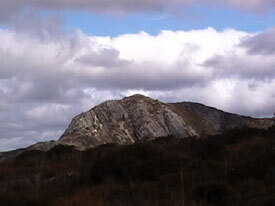 Further away from the hill. 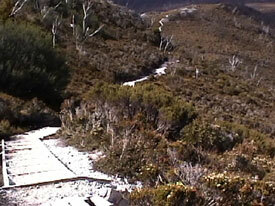 The trail ahead leading up to the Overland Track. 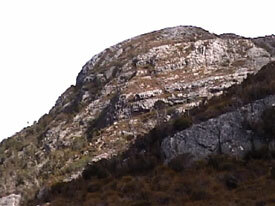 After climbing the hill and looking back. 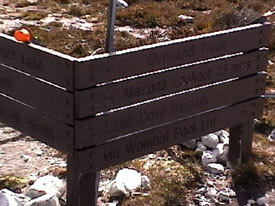 The sign pointing back to the carpark. I made the "1 hour" journey back in about 20 minutes. Whew! 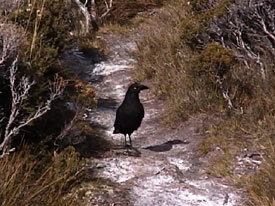 A fearless bird I came along. For a while, I thought it was going to attack me. Seriously. Crater Lake, a huge, blue stretch of water hidden from the tourists below. 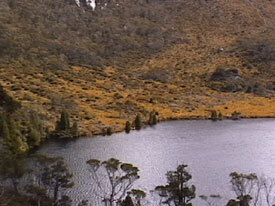 Notice the funky Australian tree towering over the lake one side but barren on the other. 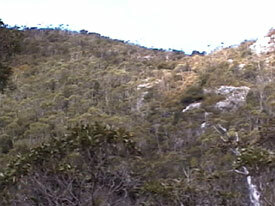 Looking away from Crater Lake into the bush. No, this photo was not doctored in any way. This walk was the first time I've ever seen purple clouds other than in a sunset.